Figure aux tiroirs, trois autres figures et carcasse de bateau, danseurs pour le premier projet de ballet "Tristan fou"
Edward James, London (acquired from the artist). Private collection, Pennsylvania; sale, Freeman's, Philadelphia, 20 May 2007, lot 56. 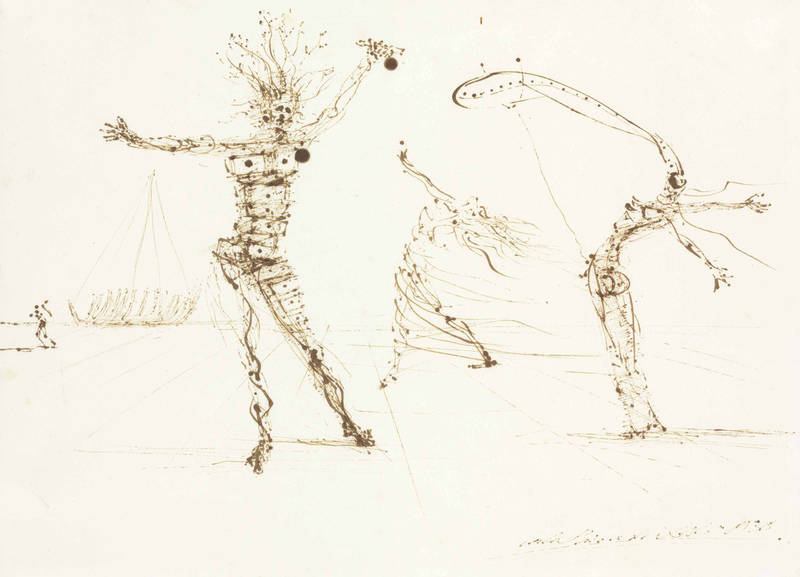 London, Robert Fraser Gallery and London, The Mayor Gallery, Fifty Drawings by Salvador Dalí from the Edward James Collection, November-December 1983, no. 40. Robert, Nicolas and Olivier Descharnes have confirmed the authenticity of this work.